While travelling recently in rural Bangladesh, one of us (Manzoor Ahmed) visited a government primary school. Sitting in the third row of a rather crowded Grade 3 class of about 40 boys and girls was Khaled. With the teacher’s permission, Manzoor asked Khaled to read. His teacher readily agreed, and Khaled read a passage from a story in his Bangla textbook. The story had been taught to the class. He read with reasonable fluency, halting once or twice, but pronouncing the words correctly. Manzoor praised Khaled’s performance and asked if he would read from the Bangla newspaper he had to hand. Khaled stood quietly and was not responsive. Encouraged by the teacher not to be shy, he tried to utter the syllables of the words in the headline. He could not read full words or the sentence. Khaled, a nine-year-old Grade 3 student, obviously could not read an unfamiliar text. The textbook passage had been read out and repeated in the classroom and he could repeat it. However, he had not really learned to read. Reading requires mastering and decoding letters of the alphabet, assembling them into words, and giving appropriate meaning to the string of words. If Khaled cannot read a Bangla text unless it has been drilled in class, he will not be able to read textbooks in higher grades. He will not be able to do his math studies, because that requires reading the instructions for addition, subtraction, multiplication and division. How many primary students across South Asia are in Khaled’s shoes? By general consensus the most important objective of primary schools is enabling students to read and write the relevant regional or national language. If children do not pursue at least five years of reasonable-quality education, they are unlikely to achieve literacy – and are unlikely to read and write later in life. In a survey undertaken simultaneously among adults in a Dhaka slum and in a low-income rural village in Bangladesh, three quarters of the adults sampled had not advanced beyond Grade 2.1 Among them, 3 per cent reported being able to read. Among those who had studied to Grade 5, two thirds reported they “can read well” and the remainder reported they “can read a little.” Only among the small percentage who had studied to Grade 6 or above did all report they “can read well.” This result has been replicated many times. To pose a little more precisely the question as to how many are in Khaled’s shoes, consider the ASER results in the terminal primary year (Grade 5). Slightly under half of the Indian children successfully read the Grade 2 sample text, slightly over half in the Pakistani sample. There are approximately 200 million children in primary school in South Asia, about 40 million of whom are in Grade 5. If half these children cannot read at the Grade 2 level, about 20 million are in Khaled’s shoes at Grade 5. The second core primary school objective is that children learn the four basic mathematical operations (addition, subtraction, multiplication, division). In the same ASER surveys, 28 per cent of Indian children in Grade 3 could perform two-digit subtraction problems (such as 73 – 36 = 37) from the Grade 2 curriculum. The comparable Pakistani statistic was 44 per cent, and in our pilot Bangladesh study it was 18 per cent. The third core objective is that children learn some basic scientific ideas. Pursuit of basic literacy, numeracy and scientific understanding is universal in school systems across the world. Obviously, achieving these three outcomes cannot define the full curriculum. A good primary school teaches children to interact socially and to learn cultural expectations and ideas. This component of the curriculum must be anchored in local culture and values specific to the country in question. Why does it matter that all children receive a quality education – starting with a solid basis at the primary level? The question is worth asking, even if the answers seem obvious. enabling people to continue learning and developing their capabilities, on their own or by participating in further education. If we are discussing South Asia, the first observation is that Sri Lanka is an outlier in terms of per capita GDP, under-five mortality and poverty (see table 1). Its outcomes are closer to those in Thailand and China than to those of the four other South Asian countries. We refer to adult literacy as a proxy for the “human capital” created mostly by the primary school cycle. Literacy should be considered as a continuum, from recognition of an alphabet and words to fluent reading of texts. However, to undertake any quantitative analysis we need a benchmark. In what follows, we use literacy statistics as reported by UNESCO. A respondent is deemed literate if he or she can read a simple sentence. 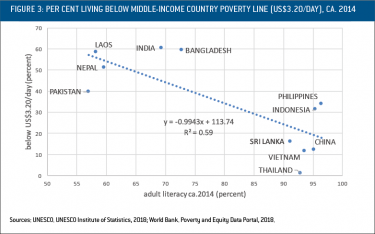 By this very modest benchmark, UNESCO estimates that the adult literacy rate in South Asia averaged about 68 per cent over the last decade, well below the average of 74 per cent among countries labelled “lower-middle-income” (see note 6) by the World Bank. Given South Asia’s large population, more than half of the world’s illiterate adults, as defined by UNESCO, reside in South Asia (389 million out of a total of 758 million). Not surprisingly, there is high correlation between literacy rates and per capita GDP among low-income and low-middle-income countries. Association is not necessarily explanation. Perhaps the story to tell about education and prosperity is not that higher literacy plays a crucial role in increasing per capita GDP. Perhaps the story should be reversed: once families have higher incomes, for whatever reason, they want higher education levels for their children and, given higher prosperity, more families can afford to pay higher taxes for government schools or fees for private schools. In the long run, the reverse story, or a story of mutual reinforcement, is important. It does not, however, undermine the argument that literacy, as proxy for human capital in low-income countries, is a crucial determinant of future economic development. 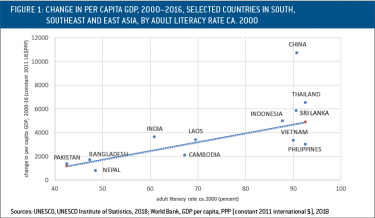 Figure 1 illustrates, for 12 countries, the change in per capita GDP from 2000 to 2016 against adult literacy rates in 2000 – which avoids the reverse causation dilemma. The criteria for inclusion are that the countries be in south, southeast or east Asia; that in 2000 their per capita GDP (measured in 2000 and 2016 in constant 2011 purchasing power parity dollars) be below US$10,000; that their population exceed five million; and that reliable data be available. While the figure includes data from only 12 countries, they cumulatively comprise half the world’s population. Of total world population, three in eight reside in either China (19 per cent of the world total) or India (18 per cent). Pakistan (3 per cent) and Bangladesh (2 per cent) rank respectively sixth and eighth in terms of national population; Nepal and Sri Lanka are relatively small. Collectively, the five major South Asian countries comprise nearly a quarter of the world total. As recently as 2000, China’s per capita GDP was not an outlier relative to South Asia (see table 1). Admittedly, it was more than twice that of Bangladesh and Nepal, and roughly one and a half times that of India. But its per capita GDP was only two thirds of Sri Lanka’s, and essentially equal to Pakistan’s. Since the beginning of this century, China’s massive rural-to-urban migration in combination with advances in basic education and literacy has led to its emergence as the world’s dominant manufacturing nation – the outstanding economic and development event in the world in this period. This migration has had a major impact on Chinese labour productivity and, not surprisingly, even after adjustment for adult literacy rates in 2000, China’s increase in per capita GDP is well in excess of the increase among the 11 other countries. GDP is an imperfect measure of economic prosperity. Nonetheless, it is a useful first approximation of national economic development. Per capita GDP is an average; it cannot tell us anything about the distribution of income within a country between poor and rich. Similarly, adult literacy rate is a useful, if imperfect, measure of the average per capita human capital available to a nation’s economy. National literacy rates underestimate inasmuch as they ignore both human capital transmitted intergenerationally via “learning by doing” and human capital generated among the minority who proceed to secondary and tertiary education. On the other hand, current literacy rates overestimate human capital inasmuch as many of those deemed literate by the UNESCO benchmark have a very limited ability to read and to use their reading capacity in daily life. Figure 1 also illustrates an equation arising from a very simple regression of national changes in per capita GDP from 2000 to 2016 in terms of national literacy rates at 2000, plus an index identifying China. The index variable acknowledges the uniquely successful Chinese exercise in rural-to-urban migration and industrialization. The resulting equation fits the data remarkably well.4 Among these low-income countries (in 2000), the literacy rate appears to be a crucial variable for predicting subsequent economic development. In their analysis of per capita GDP growth among 50 countries over the four decades between 1960 and 2000, Eric A. Hanushek and Ludger Woessmann undertake a similar exercise, initially using mean years of national schooling as a measure of national human capital.5 The variable is positive and statistically significant, but the explanatory power of the resulting regression is weak. 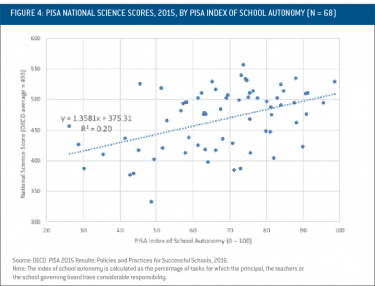 When they add an education outcome variable (the average of several mathematics and science student assessments), the explanatory power of the regression becomes impressive, and the mean years of schooling variable becomes statistically insignificant. Their sample countries are at the upper-middle-income level or higher; hence, they concentrate on measures of secondary school performance. While their study includes a few control variables, both their 50-country analysis and our 12-country exercise are statistically simple (some would say simple-minded). Certainly, many institutional factors, ignored in both these studies, matter. However, adding complexity does not blunt the central conclusion: achieving reasonable-quality primary education outcomes is a necessary condition for escaping low-income status. The process of economic development cannot be reduced to the organization of good schools. If a supply of workers with appropriate skills at the country’s level of development is necessary, so too is the presence of employers wanting to hire them and an institutional framework conducive to entrepreneurship. Channelling entrepreneurship requires an appropriate regulatory framework. It is worth distinguishing between the six countries with female literacy below 70 per cent (which include all South Asian countries other than Sri Lanka) and the remaining six with female literacy at 90 per cent or higher. Among the first group, mortality rates are above 30 per 1,000 live births; among the second, all have realized a rate below – most well below – that threshold. 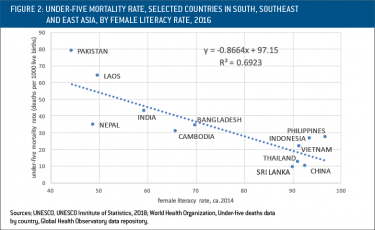 The large deviations from trend in Pakistan (with mortality well above projection) and Nepal (mortality below projection) indicate that, independent of female literacy, the quality of health services is an important factor. Many factors other than female literacy are relevant here; however, the association between female literacy and public health outcomes is one of the most robust of epidemiological results. There are many routes whereby literate mothers are in a better position to raise healthy children than those who are not literate. They are better able to make appropriate use of public health services, such as prenatal and postnatal checkups, and follow written health advice. If literate, women can earn more and thereby increase family income. All else being equal, children fare better with fewer siblings, and there is a powerful association between higher female literacy and lower number of children per family. Presumably, the underlying dynamic with respect to family size is that literate women exercise more influence within the family and, in general, they want small families. Admittedly, there is more to an analysis of fertility than the empowerment of women. China’s “one child” policy has been a powerful external incentive in determining family size in China. A common feature of low-income countries undergoing economic development is high income inequality. In low-income countries, the well educated realize very high incomes relative to median country income; government ability to redistribute income via taxes is weak; only a minority of the rural labour force enjoy the education required to gain access to higher-paying urban employment. Given these realities, countries that prioritize primary education and achieve high adult literacy substantially increase the supply of workers able to participate in nontraditional jobs, which in turn can dramatically lower the proportion living in poverty. Figure 3 illustrates the population share living below $3.20 per day against adult literacy rates. As we have come to expect, there is a sizable difference between the average for countries with adult literacy above 90 per cent and the remainder, which have literacy below 75 per cent. Four of the five South Asian countries are in the relatively low-literacy group. Completing the primary cycle is a low rung on the education ladder. For middle-income countries to prosper, they also need to realize quality secondary education among a substantial share of the next generation. That brings us to our fourth goal: a good-quality primary education is the necessary condition for people to continue learning, either on their own or via further formal education. To sum up, if we accept the importance of economic development, good population health outcomes, low poverty rates and education beyond the primary level, and the importance of literacy in realizing these goals, then the case for quality primary schooling is overwhelming. Why is school quality a serious problem in South Asia? Given these results, India, Bangladesh and Nepal could claim to have more or less satisfied the “letter” of MDG2. But they did so by ignoring its “spirit.” They lowered standards for certifying primary school completion. The best quantitative evidence of very low standards is the ASER results discussed above. A question that immediately arises is: Why has there not been massive public pressure to improve standards? There are several answers. The first is that those best placed to protest have little personal incentive to do so. Elite families rely on high-fee private schools to educate their children. Among low-income families with some discretionary income, an increasing share now choose “low-fee” private schools. In India and Bangladesh, the share of primary school students in nongovernment schools has risen from about 20 per cent to 30 per cent over the last decade. A second reason is that low-income parents, many of them illiterate, do not have the ability to judge the quality of government versus private schools or the discretionary income to pay for private schooling. To the extent that the truly poor abandon government schools, it may be for a no-fee charity school (such as a madrassa) with standards no better than government schools. The combination of elite and middle-class families disengaged from the public-school system and the difficulty of low-income families in gauging school quality has enabled politicians and administrators to maintain the status quo with little public outcry. A second question then arises: Even if they have avoided public criticism, why would governments want low standards? Surely, senior politicians and public officials understand the basic rationale for improving education levels and the importance of quality primary education. To be fair, many do understand. However, at this point we must bring quality of governance into the discussion. Reputable indices such as the Worldwide Governance Indicators and Transparency International provide depressing evidence: relative to most low-income countries, South Asian countries (Sri Lanka and some Indian states excepted) display high perceptions of corruption, high perceptions of political instability and low perceptions of government effectiveness in delivering basic services such as health care and education. Only on the dimension of relative honesty in elections and freedom of the press do South Asian countries match or outperform other low-income countries. Parents who want a decent education for their children have a primary interest in how schools function. In the language of principal–agent analysis, they are the principals – not to be confused with school principals. At the same time, administering schools entails agents – senior-level administrators, school principals, teachers and so on. Many of the agents’ activities positively contribute to realizing children’s education, but some of those activities do not. A central feature of principal–agent interaction is the role of information: agents have knowledge that the principals lack, and it is costly if not impossible for the principals (parents in the context of schools) to get the relevant information and act on it. For example, parents presumably want teachers hired on the basis of competence and willingness to teach diligently in the classroom during working hours. However, the custom appears widespread across South Asia that applicants for government teaching posts offer to education officials or local politicians a substantial sum (as much as US$10,000) as a precondition for being hired. This leads to the hiring of teachers on the basis of applicants’ financial resources and not on an evaluation of their potential as future teachers. From the perspective of parents this is adverse selection – an incentive structure that increases the probability of teachers being hired who are likely to be inappropriate and who cannot effectively serve as role models for students. Once they are hired, supervision of teachers is often lax and they are in a position to engage in private tutoring of their students, for which parents pay. Here is moral hazard – an incentive structure that encourages teachers not to carry out their duties in a manner that parents would prefer. Given opaque decision-making, interagent collusion arises. For example, senior administrators and politicians share the boksheesh paid by applicants for teaching positions. In exchange, administrators tolerate lax supervision of teachers who economize on time spent teaching in the classroom, and prioritize paid private tutoring. Interagent collusion differs by country. In the last decade, the government of Bangladesh introduced a mandatory nationwide exam (Primary Education Completion Exam) in Grade 5. The stated purpose was to standardize the criterion for primary completion, relative to the status quo ante in which local jurisdictions exercised autonomy over evaluating completion. However, exam questions are frequently leaked and teachers engage in extensive private tutoring. Much of the tutoring requires that students in their final year memorize answers to exam questions.10 This increase in tutoring can reasonably be interpreted as an extension of collusion between teachers’ unions on the one hand and senior administrators and politicians on the other. Another feature peculiar to South Asia – especially Bangladesh, India, Nepal and Pakistan – is that a preservice qualification and certification for teaching is not a requirement. In many countries – including China and other southeast and east Asian countries – young people after the higher secondary level are first recruited for a four-year university general degree program, with education as a major subject of study. Thus the graduates are prepared professionally, intellectually and emotionally to take up teaching as their life occupation. 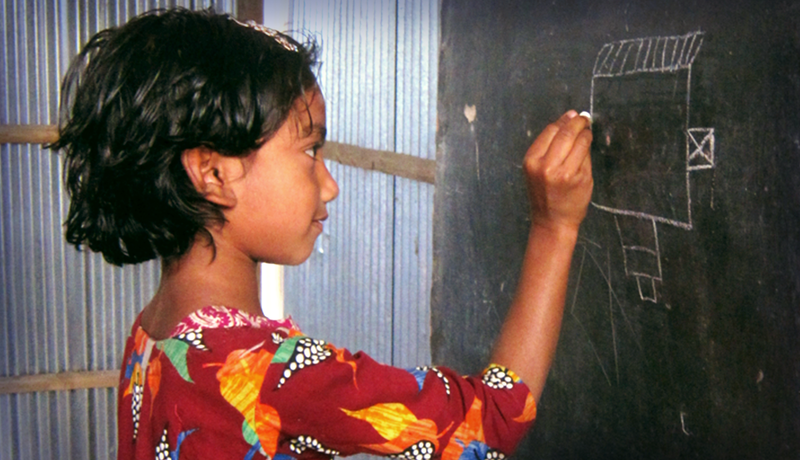 In South Asia, teachers are sent for pedagogy training after they are employed in a school. School teaching is among the last choices for university graduates, a fallback position, and those recruited are not the more capable graduates. Among those appointed as teachers, many look for opportunities to move to other jobs. Quality of teachers – their recruitment, preparation, professional development and incentives – is a major obstacle to quality assurance in primary education in South Asia. No solution to this problem is available in the context of the prevailing principal–agent dynamic. Another aspect of principal–agent analysis is the impact on outcomes from alternative allocation of responsibilities to the various agents in the system. South Asian school systems are extremely centralized. In India, individual states are responsible for primary education. Given the population of Indian states (the largest is over 200 million), and of Pakistan and Bangladesh, the number of students per school system is very large. (In Bangladesh there are 20 million primary school students in more than 100,000 primary-level institutions run essentially by the Directorate of Primary Education in Dhaka.) Centralized responsibility may realize scale economies (e.g., a lower cost per textbook if the central ministry contracts to supply all textbooks.) On the other hand, centralization increases the chain of decision-making; in general, it slows decision-making, expands the information requirements for the making of managerial decisions, and often ignores critical local conditions. The Program for International Student Assessment (PISA) is an ambitious survey of student performance in three subjects (reading, mathematics and science) at the upper secondary level, conducted at three-year intervals by the Organization for Economic Cooperation and Development (OECD). The 2015 round comprised samples in 70 countries: all OECD members plus many others, including several middle-income countries. In addition to surveying students, the 2015 PISA survey posed a series of questions to school principals in the sampled schools of each country. PISA used the results to undertake a comparative analysis of the impact of alternative school governance arrangements on student outcomes. Decentralization of public services with accountability and responsiveness to the beneficiaries’ circumstances enjoys rhetorical support in South Asia. South Asian countries have local government structures with officially stated roles and functions, which could include the management of basic education services. Effective decentralization, however, is subject to admnistrative history, the ideology of those concerned and vested interests at play. In all South Asian countries – with the exception of Bangladesh, which seems to take pride in its unitary government – local government bodies, such as the panchayat raj in India or its equivalents in other countries, are supposed to exercise certain functions in delivering primary education for the children of the local community. In reality, local control is minimal throughout the subcontinent; the centralized bureaucracy, aided and abetted by politicians, plays the dominant role. What can be done to change this reality is a political economy puzzle yet to be solved. The PISA analysis makes a strong case for greater decentralization of public education system management, and may suggest clues as to how South Asia can go about it. John Richards, co-publisher of Inroads, has undertaken numerous social policy research projects in Bangladesh over the last two decades. 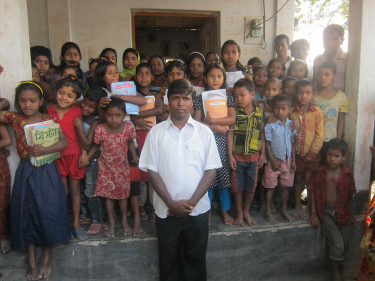 Shahidul Islam, currently USAID education team leader in Bangladesh, has specialized in primary school innovation. Manzoor Ahmed has occupied senior positions in UNICEF, was founder-director of the Institute of Educational Development at BRAC University in Dhaka, Bangladesh, and has played a major role in research and advocacy on behalf of early childhood education. His most recent publication deals with the role of schools in teaching values. This is an excerpt from the manuscript of a forthcoming book on primary education in South Asia, to be published by University of Toronto Press. 1 John Richards and Afifa Shahrin, Education Success and Nutrition: Is there a Link?, Centre for Policy Research, Commentary 9 (Dhaka, Bangladesh: International University of Business Agriculture and Technology, 2013). 2 ASER Centre, Annual Status of Education Report (Rural), 2016 (New Delhi, India: Author, 2017). 3 John Richards and Mohammad Shahidul Islam, “Assessing Literacy and Numeracy among Primary School Students: A Pilot Survey in Rural Bangladesh,” International Journal of Educational Development, Vol. 61 (July 2018), pp. 55–63. 4 The fitted equation is ∆GDP = -2017 + 74.2×1 + 5972×2, where ∆GDP is change in per capita GDP from 2000 to 2016, x1 is adult literacy rate in 2000, and x2 is an index variable for China. The adjusted R2 is 0.82. 5 Eric A. Hanushek and Ludger Woessmann, “The Role of Cognitive Skills in Economic Development,” Journal of Economic Literature, Vol. 46, No. 3 (2008), pp. 607–668. 7 World Bank, Worldwide Governance Indicators, 2018. 8 Among the 11 countries with available data, the correlation in 2016 between percentage living below $3.20 per day and per cent rank for political stability is -0.19. Among the five South Asian countries, it is -0.74. 9 World Bank, World Development Report 2018: Learning to Appreciate Education’s Promise (Washington, DC: Author, 2018). 10 See Samir Ranjan Nath, A. Mushtaque R. Chowdhury, Manzoor Ahmed and Rasheda K. Choudhury, eds., Whither Grade V Examination? An Assessment of Primary Education Completion Examination in Bangladesh, Education Watch 2014 (Dhaka, Bangladesh: Campaign for Popular Education (CAMPE), Bangladesh, 2015). 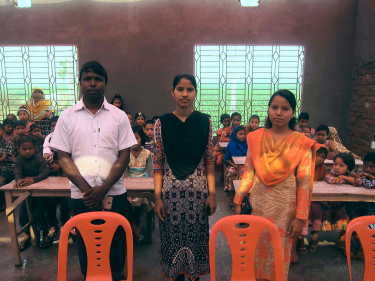 In our recent survey using the ASER protocol in northern Bangladesh, 47 per cent of students in Grade 5 attended private tutoring classes. In a regression analysis employing control variables, students’ use of tutors had no detectable effect on ability to read the sample Grade 2-– level story; tutoring had some positive impact in the case of performing subtraction and division. 11 Very similar figures can be drawn showing the impact of school autonomy on reading and mathematics outcomes. 12 UNESCO, Education for All 2000–2015: Achievements and Challenges (Paris, France: Author, 2015).